Drifted away and all alone at sea? No panic when you are geared up with TB-520D! The AMEC TB-520D is a CE approved AIS Diver Beacon. It greatly enhances the chance of adrift diver to be recovered by alerting nearby vessels equipped with AIS. TB-520D is built with state-of-the-art technology. It is buoyant and water-resistant for 100 meters. The built-in high-sensitivity GPS receiver enables GPS positioning within one minute. 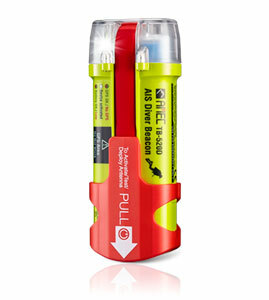 It is small and lightweight, easy to use and totally reliable to keep you safe and sound.